888sport has finally changed their free bet offer. In order to be eligible for this offer, you just need to open a new 888Sport account and make your first deposit using the 888sport code 30F. Place a bet of £10, get £30 in free bets. 888sport free bets will be divided in two £10 Free Bets and another £10 Free Bet for mobile upon bet settlement. A Qualfying Bet is a stake of at least £10 or £20 each-way, placed on any sports markets at minimum odds of 1/2 (1.5). Register your new account at 888sport today and get your special free bet bonus offer from your first deposit. You must be aged over 18 to open a 888sport betting account. 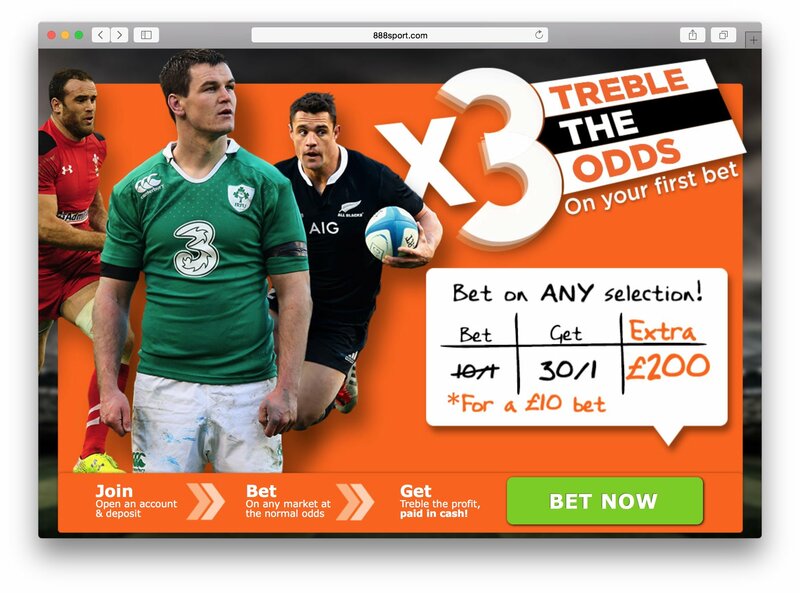 Treble your odds promotion open to UK & Ireland residents only. T&C's apply. You must be aged over 18 to open a 888sport betting account. Looks like 888sport isn't promoting any special offers, right now. Check back soon! 888 should stick ton there casino offering and poker site . Should have rated this 3 stars but received great customer service after a dispute. 888 have very good odds for most of the markets that they cover. They cover a lot of markets too, including American football, Aussie rules, basketball, boxing, cricket, cycling, darts, football, golf, greyhounds, horse racing, ice hockey, motor sport, rugby league, rugby union, snooker, tennis and UFC. On top of this, there is a lot of in-depth markets you can place on most football matches and horse racing as well as other sports. Their website is good and quick for making in-play bets, you don't need to be an experienced punter to use this site. My favourite thing about 888 and why they are my number one bookie is because of all the offers they have: Free Mobile Bet – the first time you use their mobile app, place a £5 bet on anything at odds of 1.5 or above and if you lose you will get your stake refunded as a free bet. 2. Football Acca Club – place three to five £5+ accumulators in the same week and you get a £5 free bet. If you place 6-10 accumulators you get a £10 free bet, 11-15 is £15 and 16+ is £25. 3. Football Euro Acca Insurance – place an accumulator with 4 or more selections on the Champions League or Europa League and if only one leg lets you down you get a £25 maximum refund per bet. Bet £10 get £40 free bets. Great website esey to use. Amazing site, loads of markets. Fair in its dealing with customer and simple to use. I really like how easy to go from casino to poker to sports book and great bonus offers too. One of the better bookmakers! Free bet from 888sport delivered as promised. Mobile bets are far easier than any other bookie Iv used. 10 out of 10 from me. Amazing free bets and offers. I love 30 free bet offer. But site is very slow. They used to have a treble odds promotion back before. Now this one is looking much better, clear conditions. The only problem is website which sometimes freezes up, but apart from that its a good bookie with one of the besta bonus offer currently. I staked 10 and got 30 free bets and 10 casino bonus. Thanks to 888sport I won 200 pounds in total. Huge sign up promotion and wide range of sports. Highly recommended. Up there with the likes of bet365 and others! Really can't fault them , very good well payed out online bookmaker. Impressed with all that's on offer on the sports side, casino and poker aren't too bad either well worth a sign up. Can definitely tell that 888's main focus is the casino, however it doesn't make it a bad sports site. It isn't one of the best I've used but also not the worst, it is quite slow and crashes often but the bets available are okay. The bonus however is amazing, £30 in funds is very nice and can go a long way on this site. Offers a decent amount of markets and is easy enough to use but making withdrawals on the site is a right pain! I understand verification is needed but it is much easier on other sites! One of the best welcome offers probably a underrated site. Great welcome offer when the first deposit is put in Customer service is quick and reliable Good odds with a slick website Good promos and easy to use in my opinion. I think 888sport is underrated. It's one of the best bookies out there. Lots of promotions and free bets. They always have something special for you. They still need to upgrade the site because it's really slow otherwise 5 stars all day long. Great online site and offers to match , underrated site in my opinion one of the best around. A word-class bookmaker with very competitive odds that you won't find anywhere else. Good site, need some more player props on NFL Sundays but other than that they get a solid rating from me. Anyway great and trustworthy sportsbook that pays when they are supposed to. Nothing particularly special - I don't use them often as I find the interface slightly clunky. Especially on the app. Decent betting site some decent promos. Mobile app needs a bit of work! This betting site offers some great promotions. Fast withdrawals to ewallets. The only down side is the speed and the interface of the app. Overall a good bookmaker. 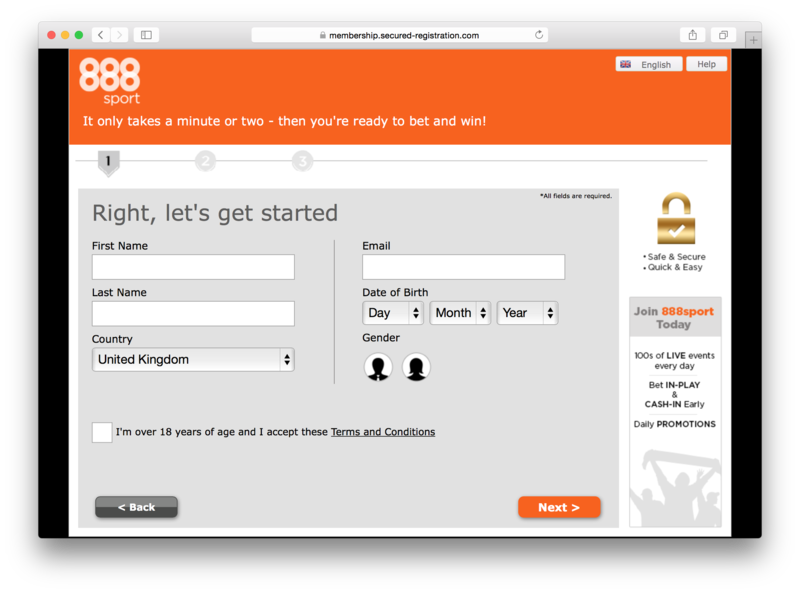 888 sport is a partner of its more popular 888 casino, the websites look like they were made in 2001. However they offer a lot of inplay tips and again lots of pre match bets, as well as many other sports. The cash out is quick yet again taking 1-2 working days, easy to navigate the website needs updating though.